Sabina added some prunes to the cake she was making. Eugene pruned a few branches from the tree. The editor told Paul he needed to prune some of the more flowery language from his book. Prune also used to mean the same as preen, but that meaning has now fallen out of use. Prunes may be a humble variety of dried fruit, but the local Agen prunes are much celebrated in the Lot-et-Garonne department of France. There is even a prune museum in Lafitte sur Lot. You can read more about the production of Agen prunes here, where there is even advice on how to prune a plum tree so that you get lots of plums to dry and make into prunes. 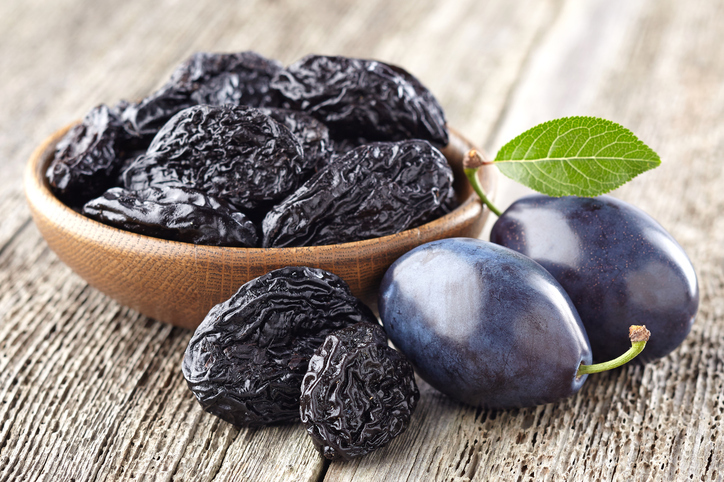 Prune, as a noun meaning ‘a dried plum,’ dates back to the early to mid-14th century. In Late Middle English, prune could actually mean a fresh plum as well as a dried one. It came into English from the Old French pronne (plum), and can be traced back to the Vulgar Latin pruna, the singular feminine form that derived from pruna, the Latin plural form of prunum (plum). Prunum came into Latin from the Greek proumnon, which was borrowed from a language from Asia Minor. Prune has been used as slang to refer to old people (especially women) or disagreeable people since the late 19th century, and the related verb prune, meaning ‘to wrinkle,’ is also from the late 19th century. The verb prune, meaning ‘to cut back branches, leaves or roots from a plant’ or simply ‘to chop off’ something unwanted, dates back to the early 15th century. The Late Middle English verb prouynen also came from the French, in this case the Middle French proignier (to cut back vines), but its origin before then is uncertain. Some linguists believe it emerged as a variation of the Old French word provain (scion or later of vine), from the Latin propago, making it related to English words like propagate and prop. Others think it came from a Gallo-French construction, pro-retundare (cut in a rounded shape), from the Latin pro- (forth) and rotundus (round), making it related to the English adjective round. Finally, some think it is identical to the Middle English verb proinen or proynen, a falconry term meaning ‘to preen‘ (feathers), which is why it was, in the past, used as a synonym of preen.